Ross & Cromarty Roots | Rosskeen Churchyard. The former Rosskeen Parish Church is next to the southern end of a minor road, which connects the A9 (at the Rosskeen Free Church) to the B817 between Alness and Invergordon. This is a large burial ground, well-kept, with modern extensions. Its size and the number of naval graves reflect its proximity to Invergordon, one of the larger of Ross & Cromarty's communities, and the town's history as a naval port. The church is disused. It is listed grade 'A', together with the remains of an earlier chapel and a Munro family mausoleum. Picture Added on 25 December 2008. 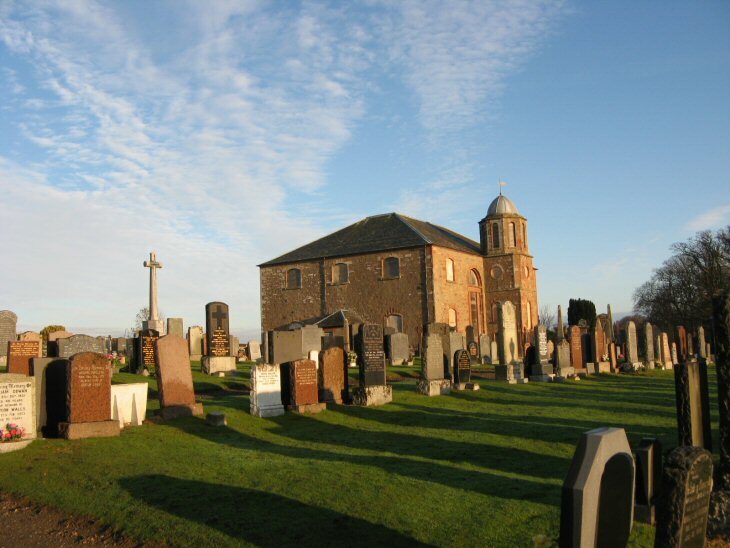 Thanks for posting this photo, from records this church was built after My Ancestors Alexander Munro and Ann Mckenzie were married here at this site in the older church of 1790 of which there is only a few remains left near the Mausoleum of the Munros of Newmore. Added by David Lauder Munro on 27 December 2008. I'm searching for the grave of Iain MacDonald who died 3rd of February 1948, he died in Invergordon Hospital. Added by Keeti Matene Rawiri on 19 July 2009. Hello Keeti, I've not completed surveying Rosskeen and if I come across Iain Macdonald I'll let you know. Added by Roddie on 19 July 2009. Thank you very much and l look forward to any information that you may come across. His parents were Donald and Margaret Ann MacDonald and resided at East Mains, Urray, Mains of Ord, Ross and Cromarty. Added by Keeti Matene Rawiri on 20 July 2009. I am looking for any info on pre 1790 of the parents of Elizabeth or Catherine McKenxie who was a member of the Rosskeen church at the time of her marriage to Alexander Munro in 1790. I have hopes that someone could direct me to old records as so far have no replies from Invergordon records. Added by David L Munro on 25 July 2009. Wow what a great site, just come across this. I am looking for the gravestone of John Fraser who married Janet Logan 1823. I think John died 18th May 1865, his parents were Simon Fraser and Christian McKenzie. Think John was born Rosskeen around 27th Nov. 1790. My husband and I had a wonderful visit to Alness in August this year. Joan Ross of the Heritage Centre was most kind, driving us for miles around the area and supplying family baptism records. We wandered around this wonderful burial ground in the hope of finding any ancestors, but our time was limited. Is there any way I could search for my ancestors William Fraser and Christian Ross who were married in the area in 1792? Their daughter Jane Fraser (born 1807) married William Munro (born 11 Sep 1797) on 12 Aug 1825 at Newmore. They travelled here to Australia with their children in 1839. I have seen Jane's tombstone at Singleton, NSW, Australia and would love to locate the records of her parents. Hope you can help. Added by Robyn on 26 November 2009. Added by Patricia Clelland on 12 January 2010. I'm looking for the burials of John Ross, bn c.1790 and his wfe Ann, bn c. 1794 maiden name Reid from Rosskeen, possible Highlands where they were married in 1815. They had one known son William Ross bn 1816. I have the burial for Willam from the New Spynie Burial Ground but don't have a photo of his headstone. Added by Aileen Robson. on 26 May 2010. I believe this could be my ancestors parish and burial grounds. Does anyone have information on James MacKenzie, b. abt. 1815 m. Jessie Stewart about 1832. Jessie died about 1838-1840. They had one young son, John, b. abt. 1835 or 1836. Thank you! Added by Becky Aaronson on 11 June 2011. Looking for Gillanders Chisholm married to Magaret MacRae or son George Chisholm who was born 1759. Added by Sherry C. Miller on 07 August 2014. Looking for Betsy/Betty McKenzie who married John Campbell 1817 in Lochbroom. Added by Bronwen Summers on 12 April 2017. Does anyone have any information about the Macleod of Cadboll family vault? I visited last week and could not find and marked stones. Is it perhaps one of the ruined structures? Or was it inside? It was certainly in use in the late 19C. Added by Rosemary Yallop on 21 June 2018.